Assorted Wind Chimes add a novel contact to any room in the home, especially within the backyard or lawn. The soothing tones and melody of various wind chimes will add a definite contact to your general decoration. It’s also the perfect complement to each design theme within the house. It will be interesting to note that wind chimes have been acknowledged to be pioneered in India and later tailored by the Chinese language within the form of wind bells. Indians used to hang them near or within the entrance of their ancient pagodas with the intent to scare away birds and dangerous spirits. This led to the ancient belief that a wind chime ought to be utilized to ward of evil spirits that may persist to enter the premises. Varying cultures apart, the appeal of decorative wind chimes are widely recognized across the world. The Internet is an effective resource when searching for assorted wind chimes to cater to every whim and desire. The designs are meant to be timeless and enchantment to a wide audience no matter age, culture or creed. The soothing sound of the wind blowing towards a wind chime induces a state of calm, very like a subliminal message. It speaks to a different aspect of the brain that has the flexibility to transform you to a unique place even for just a while. Attempt to dangle a decorative wind chime in your door or garden and you will shortly study to appreciate the sound of the wind. Decorative Wind Chimes could be made out of wooden, metal, glass or a combination of the three. There are fashionable variations accessible that function an uplifted design, adept to the modern environment. The tones and sounds will vary in keeping with size or material of the suspended tubes. It might encompass a variety of high and low tones to evoke aural pleasure. When we arrived home this afternoon from Steve’s 30th high school reunion, we noticed a crow on the road snacking on the remains of a rabbit that had been flattened on the tar. Later on a great deal of squawking by several crows out front called our attention to the front lawn. 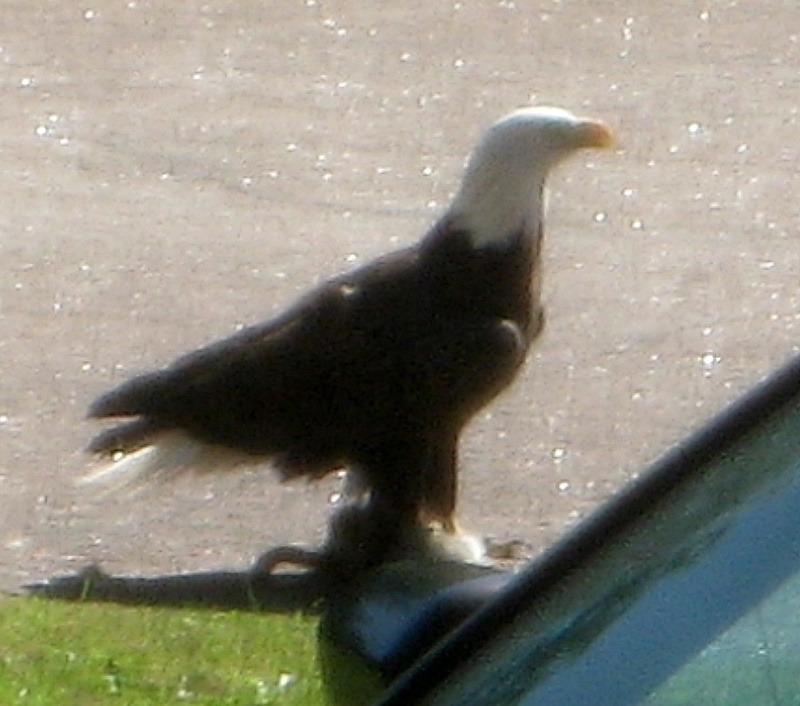 From the living room window, we noticed that a Bald Eagle had stopped in for a snack of rabbit road kill too. 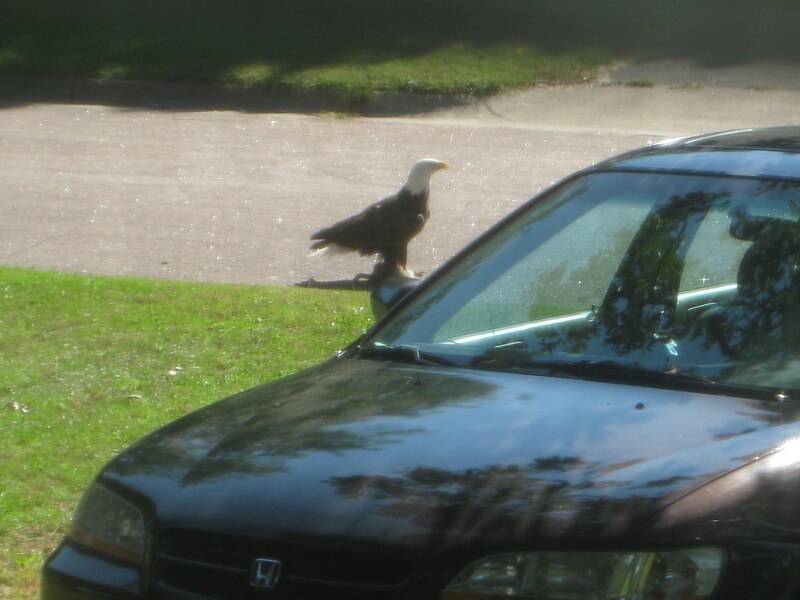 Rabbit road kill attracts a Bald Eagle to the neighborhood. As the crows moved in, the Bald Eagle grabbed hold of the rabbit and flew to the top of the neighbors roof. He sat there for a few seconds, determining if the rooftop of the rambler was a safe place to hide his catch, but as the crows flew in to reclaim their meal, the Bald Eagle once again grabbed hold of the rabbit carcass and flew over to the roof tops and landed on the roof of another rambler several houses down. The crows continued to force him on down the street and out of our view. While it is more and more common to see a Bald Eagle in the Minneapolis metro area, it is still pretty rare. The Bald Eagle population in Minnesota reached an all time low in 1972, but according the Minnesota DNR website, as of 2007, there were 2300 pairs of bald eagles nesting in Minnesota. Organic gardening is an easy way of increasing vegetables and fruit production with the use of simple items found in nature. So why would one desire to indulge in organic gardening? 1. It can immediately help make compost from garden and kitchen waste products. Though this is a bit more time-consuming than purchasing prepared poisoned baits plus fertilizers, it certainly really helps to put garbage to good use and thus saves environmental surroundings. 2. Organic farming doesn’t use chemicals that can build up and have an adverse affect on your health. Almost all of the essential when growing veggies. Chemical companies tell us that the chemicals we use are safe if used based on direction, but research indicates that even tiny levels of poisons absorbed throughout the skin can cause diseases such as cancer, especially in youngsters. An average kid ingests four to five times more cancer-causing pesticides from foods than grown-ups. With organic gardening, these incidents are lessened. Keep in mind, pesticides contain toxins which have just one purpose – to kill living items. 3. Less harm to the environment. Poisons in many cases are washed into our waterways, causing death in native fish and polluting their habitat. 4.Organic farming practices help prevent losing topsoil through erosion. It is a well known fact that a great deal of soil erodes from US farmlands every year. 4. Cost savings. There is no need to purchase expensive chemicals when organic gardening. There are many organic recipes that aid in keeping pests away, and many of these ingredients come straight from your kitchen cupboard. At times other plants may be grown as companions to aid in the healthy grown of a main crop. An example of this is the marigold, which helps to repel aphids from veggies. Mixing one tablespoon of liquid dish-washing soap and even one cup of cooking oil could make an affordable garden pest spray. Put three tbsps of the mixture in 1 quart of water and spray on plants. 5. A fairly easy mulch of pine needles will assist you to suppress the growth of weeds plus keeping moisture in. 6. Organic gardening practices keep the environment risk-free for generations to come. A gazebo is a wonderful solution for your garden and backyard hosting options, gazebos are utilized for a variety of diverse tasks these days, but first and foremost a gazebo is a great location to have family and friends enjoy your garden or your backyard. Two really unique gazebo materials are wood and bamboo gazebos. Wood is regarded to be the classic material for a gazebo. It blends in beautifully with a garden, offering an all-natural feeling and a nice flow. Wood is the basic material utilized to build the first gazebos years ago. A bamboo gazebo would add an Asian quality to your backyard. Some even make it themselves. It’s no simple task but it’s certainly possible for any individual to construct his own bamboo gazebo in several weekends. You’ll require to find the kind of bamboo you want and then you’ll require to make a plan for the gazebo. When considering a bamboo gazebo, you probably think of an elevated structure that has a bamboo flooring several inches above the ground, open from all sides and with a nice bamboo roof over it. Some even add shades so they can close any off the four sides or even all, if they want. A wood gazebo is a lot more complicated. It will need serious construction & planning and a person may not have sufficient knowledge and tools to construct one of those. If you are in the market for any wood gazebo, you ought to try and research as much as you can and have a clear idea of how you want the gazebo to look. The next thing would be to find gazebo plans or even gazebo photos you can present to an expert so that the end result will be as close as possible to what you had in mind. A bamboo gazebo might be easier to obtain, but you ought to keep in mind that building one ought to be made by someone who understands the basics of bamboo building and that the place you’re placing the gazebo will be appropriate for this kind of gazebo. A bamboo gazebo positioned on a beach is a wonderful concept, but one placed on a mountain top may turn out to be usable only a few days a year. Gazebos are a wonderful extra feature to your garden. They will also probably add some value to your property, so it’s a wise investment. No matter what kind of gazebo you are looking for, I extremely recommend exploring the market on the internet prior to making any decisions. If you want more information on Home Madaga Gazebo Canopy Importance, don’t read just rehashed articles online to avoid getting ripped off. Why Rose Bush Care is Crucial For Your PatchTo Be Picturesque. Figuring out the necessities of rose bush care is vital if you end up growing roses. This plant is among the most historic flowers around and is meant to exist even before humans. The rose can grow well in a wild setting with no help from humans at all, but if you want to make an announcement out of the roses you develop, then you better look for some rising suggestions to assist you. When taken cared of correctly, the rose bush will always look wholesome and attractive. In addition, they are going to proceed to be sturdier and more healthy each year. A lot of people are drawn to rising roses as a result of aside from being lovely, they’re also aromatic and have healing properties. There are a lot of styles of roses that have totally different colors and hues. Except for the favored pink rose, these embody pink, yellow, white, peach, and deep purple roses. Because of the varied colours obtainable, you possibly can develop a stunning design in your garden in spectacular colours if you recognize the right rose bush care. You can also develop your roses along with other kinds of flowering vegetation which are excellent for giving selection to your flower garden. Having roses along with different vegetation additionally deter harmful pests from ruining your roses whereas at the identical time attracting the nice ones to enhance your garden. When planting your rose bushes, make it possible for they’ll obtain direct sunlight no less than six hours each day. When uncovered to more daylight, the roses may be expected to have sooner and more healthy blooms. All the time consider the kind of roses that you will plant. Sure varieties develop better in sure climate circumstances, whereas others could not due to issues associated with insects. There are many such insects that you have to watch out for in rose bush care . These include rose slugs, rose chafers, scale bugs, rose can borers, and Japanese beetles. Author AdministratorPosted on September 14, 2010 Categories Lawn Care, Perennial Gardening, Vegetable GardeningLeave a comment on Why Rose Bush Care is Crucial For Your PatchTo Be Picturesque. When people come to your home what do they see first? It isn’t your kitchen or your newly remodeled bathroom. The first thing they see is your front yard. If you want a beautiful yard all year long, it will require continual maintenance. Some have years of experience with landscaping and yard maintenance. Those just starting out may feel overwhelmed or unsure of how to begin. These simple ideas will help you use your resources best to get a great looking yard without spending too much time or money. Color is key for a beautiful garden. Try to find attractive plants that will infuse a lot of vibrant colors into your yard. You may also want to choose similar plants or colors to create a repetitive and consistent look in your yard. This repetition is especially important in the front yard. A patio can be a great addition and should be utilized if you already have one. The patio can be the jumping off point for yard design. You may want to plant flowers or shrubs around the patio or you could do the same to the path leading up to your home. Cement walkways are particularly attractive when surrounded on both sides by flowers or bushes. Selecting plants that are native to your region can also greatly improve a garden. Through this means, you will have a garden that is more water efficient to maintain. Also birds and butterflies will be attractive to these native plants. This added wildlife always adds a welcome touch to a garden. These plants will also be well adapted to the soil and also the climate in your region. Use your creativity. Don’t feel like you are limited to traditional designs and ideas. When landscaping, creativity can make the final product more beautiful and unique. If you have a creative idea, use it. Let your tastes, style and personality manifest in your garden. You may even choose to select a theme for your yard. If you don’t have any ideas, look through magazines, websites and books. Before too long, you will see some landscaping ideas that will spark your imagination. To choose a theme, you can simply place ornaments in your yard that coincide with the theme you choose. This could mean integrating statues or sculptures. Another popular theme is the Japanese garden. This garden style is simplistic with clean lines and lots of water. Some choose to grow an herb garden and others focus on flowers. Author AdministratorPosted on September 9, 2010 Categories Lawn Care, Perennial Gardening, Vegetable GardeningLeave a comment on Does Your Garden Need A Makeover? 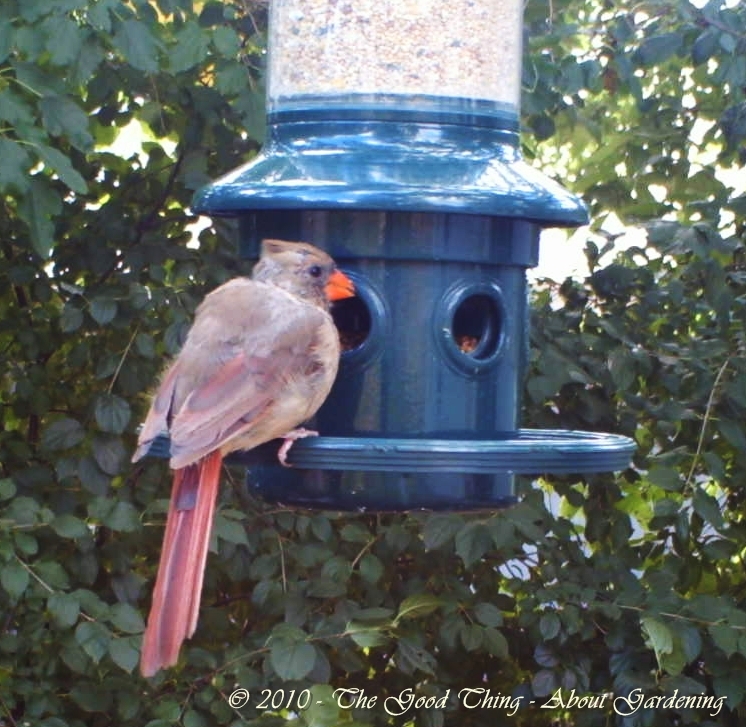 Like most gardeners, I love to see how many different types of song birds I can attract to my gardens and have several feeders that I keep filled year-round. The challenge in our yard is to find feeders that the birds like, yet are somewhat squirrel proof, as there are two 50+ year-old oak trees shading both the front and back yard. 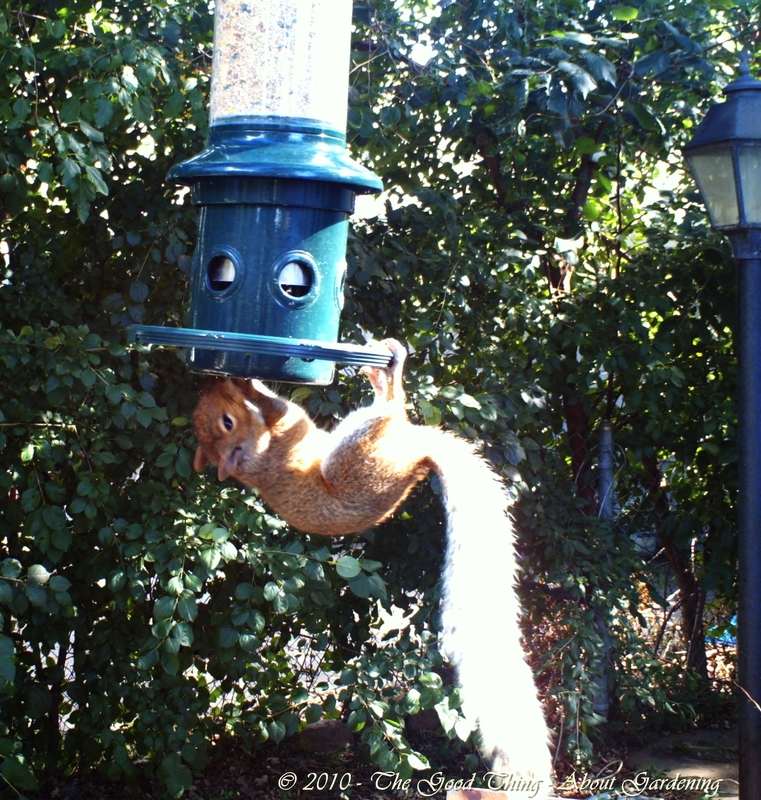 Each tree houses numerous squirrels (gray and albino), and they can easily clean out a bird feeder in a couple of days. We experimented with several different types of feeders last winter, and finally purchased a Squirrel Buster II. It’s the only “squirrel-proof” feeder that we found that has been 100% effective at keeping the squirrels from eating all the bird seed. Don’t worry- we supply cobs of corn for the squirrels to feed on in the winter time so they won’t go hungry. And just in case the corn is gone, they’ve taken the liberty of chewing a hole in the green Waste Management (heavy plastic) garbage bin large enough to fit their furry bodies through and they frequently help themselves to food scraps too. But I digress – back to the birds. We now own two Squirrel Busters. One hangs from the tree limb in the front yard and is kept filled with black sunflower seeds. We see a large variety of birds at this feeder including Gold Finch, House Finch, Downy Woodpeckers, Nuthatch, Chickadees, and my favorite – Cardinals. The second Squirrel Buster hangs from a limb on the oak tree in the back yard and that one is filled with a mix of cracked corn, millet, black sunflowers and safflower seeds. The Chickadees, Nuthatches and Finches are attracted to this one also, and the Cardinals really seem to love this mix. When I received a Wingscapes WSCA02 Birdcam 2.0 8MP Digital Camera With Flash Plus 4 Gigabyte SD Memory Card With Card reader Including D-Cell Battery Alkaline Twin Pack for a birthday gift, I was absolutely thrilled. It came with an extendable arm that can be mounted on a post or bungy cord to fix around a tree trunk. It didn’t take long to afix it to a sturdy shepherd’s hook that I relocated so that it is 4′ from the birdfeeder. The Birdcam has three different modes – motion sensing, manual, and time-relapsed. I’ve been experimenting with it and haven’t decided with mode I prefer yet, but here are a few photos of what was captured using the time-relapse mode (photo taken every five minutes) while visiting the back feeder today. 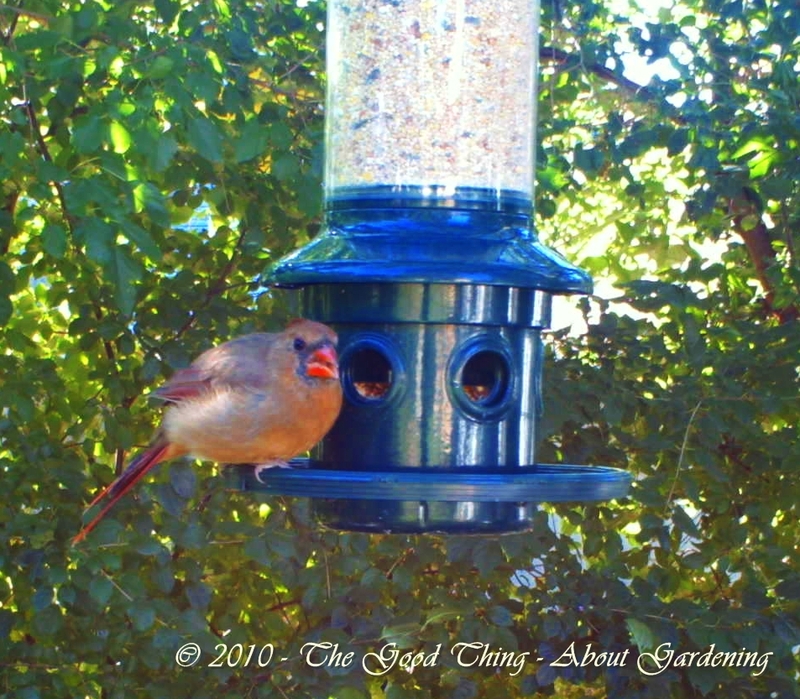 Another female Cardinal stops by for a snack. 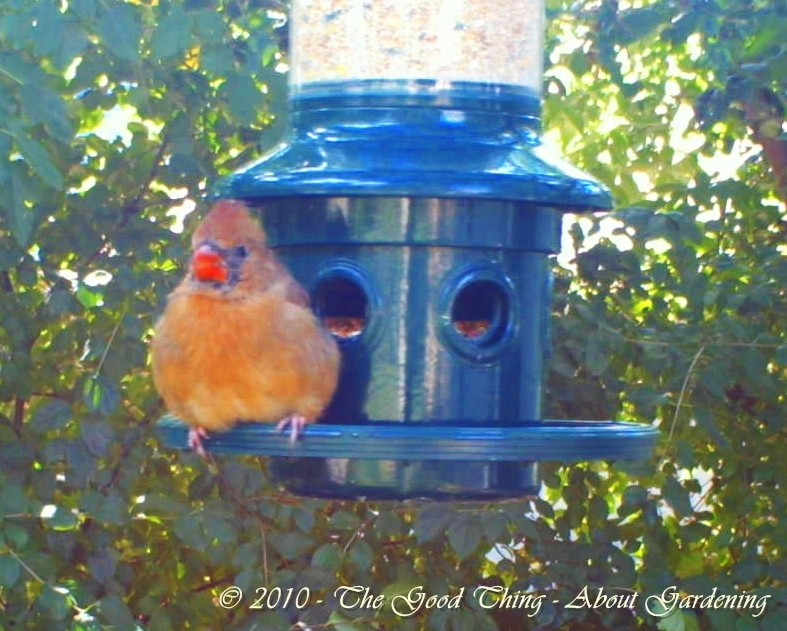 This female Cardinal looks very well-fed. 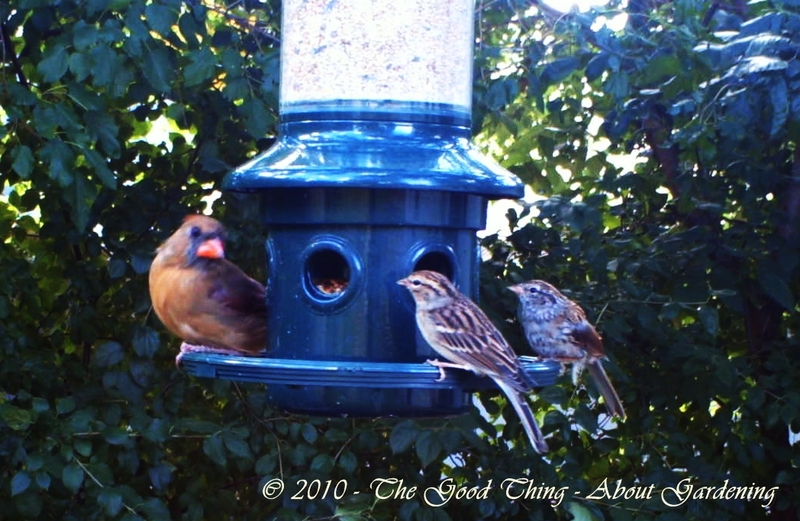 This Momma Cardinal seems to be talking to her daughters. 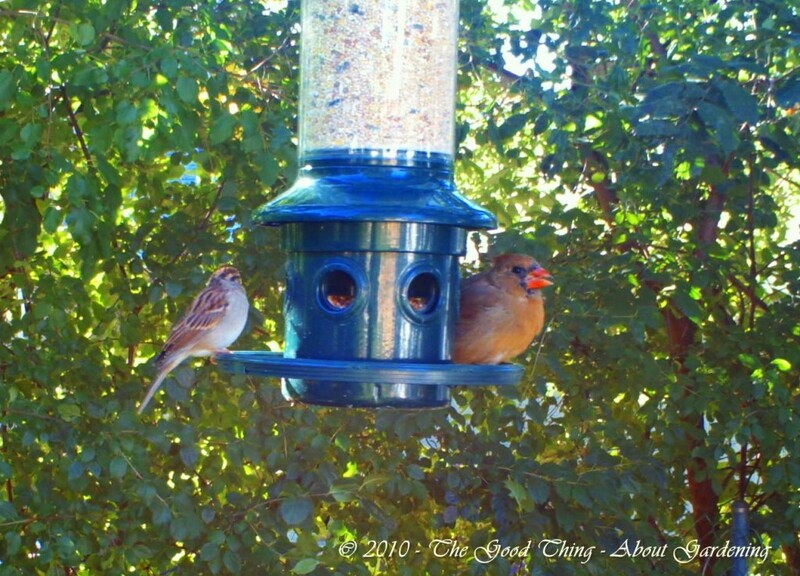 The feeder has reached maximum capacity for seating (and eating). The colors of the female Cardinal really show up here. This mom and her daughter may be avoiding each other while they snack. 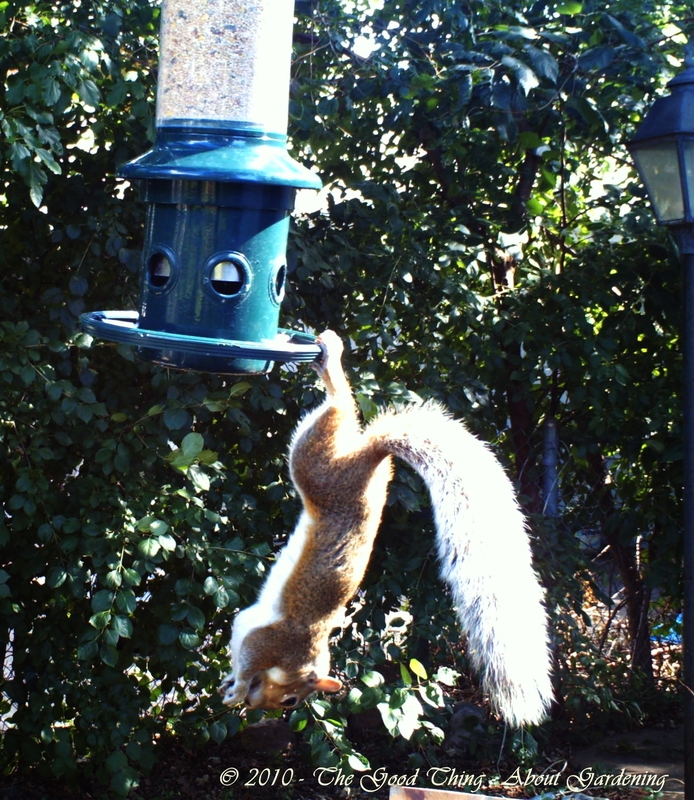 A squirrel attempts to access the birdseed, but his weight pulls the doors closed, preventing him from eating. The squirrel finally gives up on getting and seed and leaps to the ground. There weren’t any photos of male Cardinals, but I’ve seen them at the back feeder a few times. 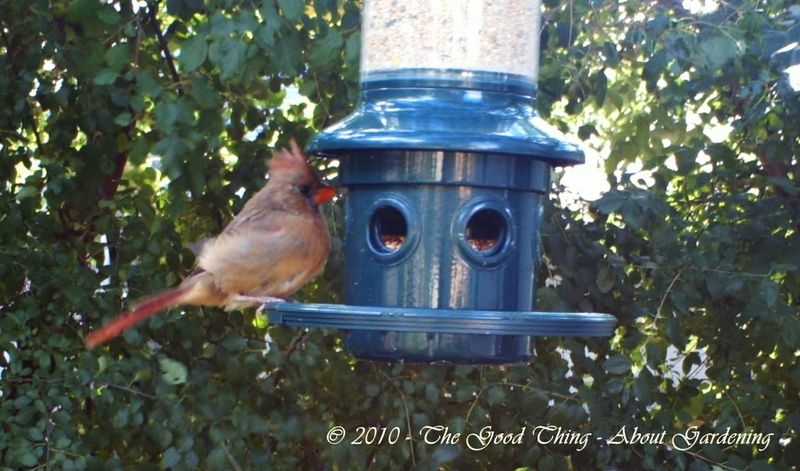 An entire family, including a male and female adult cardinal, along with 4 female young cardinals were at the feeder one afternoon. Two weeks ago, there were 5 Blue-jays hovering around the feeder, all trying to get at the seed. 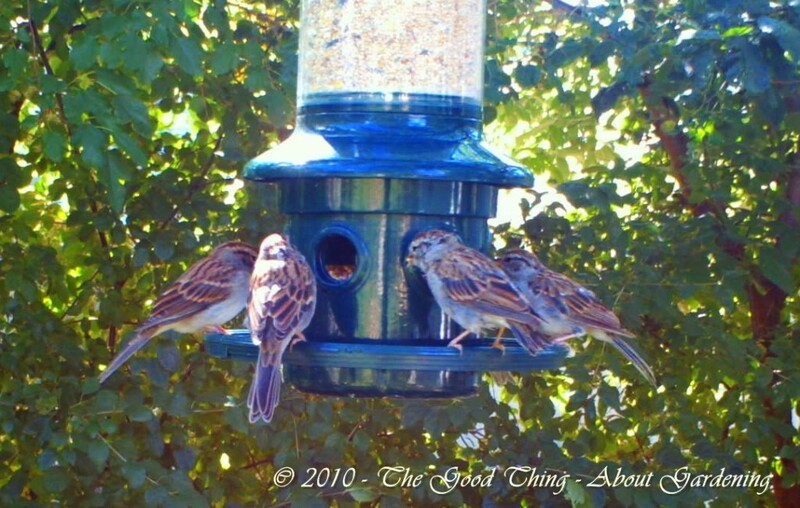 If more than two were on the feeder at a time, the doors pulled close. 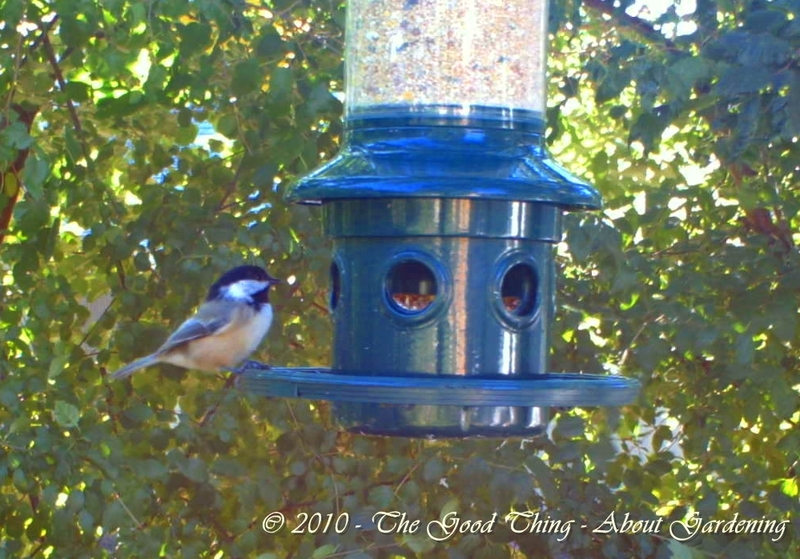 The beauty of the Squirrel Buster is that the doors close when enough weight is on the bottom of the feeder to pull it down, closing off the holes to the bird seed. I’m really enjoying my birthday gift and I’m really anxious to see what creatures will stop by tomorrow.